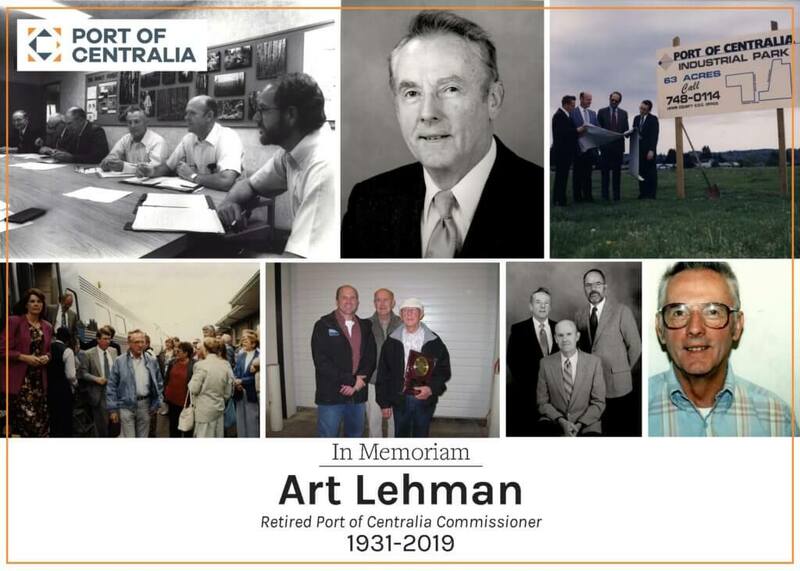 The Port of Centralia regretfully announces the passing of its former Commissioner, Art Lehman. Art was elected one of three founding Commissioners of the Port of Centralia in 1986. He retired after 25 years of service in 2011. Under Art’s leadership, the Port grew to encompass two industrial parks with over 30 tenants providing over 800 jobs to the local community. Centralia Station, currently under development, was his last project while serving on the Port Commission. He remained a staunch supporter and champion of the Port after his retirement. A lifelong resident of Lewis County and graduate of Centralia College, Art retired from the City of Centralia after 29 years as the Water and Waste Water Superintendent. He is survived by his wife, Mildred, and their two children, five grandchildren, and one great-grandchild.